Rockers, Greasers call them what you will, they were the sworn enemies of all things Mod. Greasy long hair, leather jackets, motorbikes, Rock and Roll – all these things represented the very antithesis of all things Mod. The Rocker has, thankfully, almost ceased to exist as a sub culture. 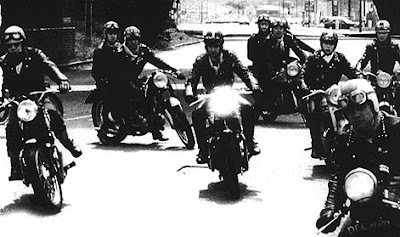 The bikers of today bear little resemblance to the leather jacketed greasers of the sixties! There were no Rockers around the Archway, or if there were they kept themselves well hidden! In fact it was extremely rare to even see a Rocker on our turf! The Rockers tended to keep to their own encampments. The Ace Café was the most famous of these and although only a few miles from our manor it was considered to be strictly ‘out of bounds’. Another venue was the Busy Bee up by Watford. Both these cafes were close to the M1 which made them ideal for Rockers wishing to ‘do the ton’ up the motorway! Another enclave was the 59 Club which, if memory serves me right, was run by a vicar down in Hackney!! That a vicar should be running a youth club for tearaway bikers always seemed rather strange to me! The club moved over to Paddington at one time before going back to Hackney. 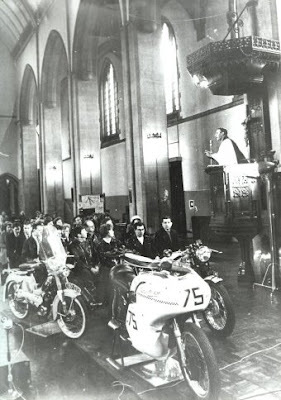 There were even photos in the press of the vicar blessing Rockers and their bikes in church! God must have been a bit of a Rocker!! 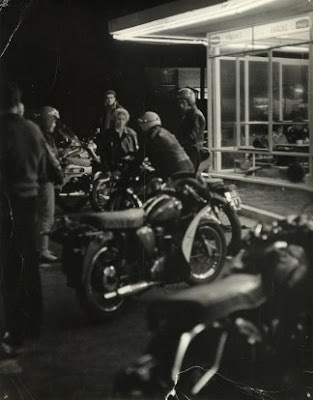 There were various others smaller divisions of greaser gangs around the capital usually based around greasy spoon cafes and usually on the outskirts where they were able to use their bikes with comparative freedom. We had occasional run-ins with Rockers but these tended to be ‘off the manor’. One such incident came when we were asked to back up another gang at Ally Pally. Alexandra Palace was a venue that tended to be used by Rockers. There was a fairground and roller skating rink there. Fairgrounds always seemed to attract Rockers. I am not sure why but there were always a fair few in attendance be it at Hampstead Heath Fair on Bank Holidays or the Kursaal at Southend – there were always Rockers! It was a strange situation, in that surrounding mod gangs such as the Highbury mob were our sworn enemies but it was an unwritten agreement that certain destinations were deemed to be neutral ground – a no mans land almost. Soho was one of these and another was St Pancras Boxing Club. 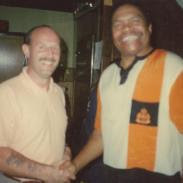 Several of our number trained at the club as did members of the Highbury mob and it was an unwritten law that any ‘bovver’ was restricted to the ring! Another occasion when forces might align would be in the face of attack from an outside force – Rockers! 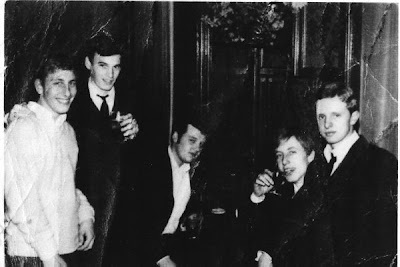 A few lads from the Tolly Park (Tollington Park was an estate of flats in Hornsey) gang had been up to Ally Pally and had been set upon by a gang of Rockers. They wanted revenge and had decided to pay a return visit. The Tolly Park were aligned with the Highbury mob but when they asked for backing the Highbury boys declined for whatever reason. As they were no match for the Rockers on their own they decided to swallow their pride and asked the Archway mob for help. It was very fortunate that on the evening they showed up at the Archway we were ‘mob handed’. Whereas normally, we would have been hard pushed to raise a couple of dozen members on this occasion a round up of cafes and pubs accounted for almost 60 members. Of course, we intimated that this was quite normal! For some time we had taken to hiding ‘tools’ in a variety of locations around the Archway. We were using a café called the ‘Jiffyburger’ at the time and a considerable arsenal was hidden behind the counter. There was another stash in an access hatch above the public phone boxes in the tube station. The carrying of weapons was a strict no no at the time. There was a constant risk of being ‘turned over’ by the Old Bill. In fact Kentish Town Police station had, at one time, assigned two plain clothes officers to follow us full time! It only took a few minutes before we were armed and ready! Plans were quickly laid and a meeting point agreed. We all split into groups and made our way to Ally Pally by cars, buses, scooter – any means possible. Ally Pally proved to be a bit of an anticlimax. There were only a handful of rockers to be found. They ‘legged it’ as soon as they saw us but we managed to catch a couple and they received a few ‘lumps’ for their troubles. Rather than waste the tri p a large group of us ‘visited’ a rocker café over in Crouch End. There were a couple of rockers inside. One of our mob declared that ‘ it stinks in here’ to which the biggest of the rockers retorted ‘Why don’t you f..k off then?’ Now, he was either very foolish or very brave but whatever the reason he disappeared under a volley of fists and feet. We left him in a pool of blood and made our escape. It was only a few days later when the local paper was issued that we found he had been stabbed and came very close to death. 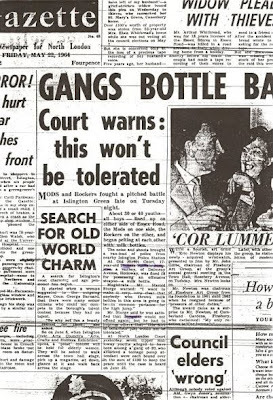 Of course this only added to our warped sense of being ‘untouchables’. The trip had done wonders for our standing in North London gang culture. A couple of nights later three of us were sitting in the Jiffyburger when we spotted a couple of vans and several motorbikes pass. Within a few minutes they were back and parking across the road. That was our signal to make a move. We gathered up our plates (we weren’t going to waste our chips!) and dashed into the tiny kitchen at the rear. Through a small crack we saw dozens of Rockers on the street. Several entered the café and the lead rocker was brandishing a sawn off shotgun. There was consternation amongst the few occupants of the café. The rockers asked if anybody had seen the ‘Archway mob?’ Of course there was no reply. By this time we were s…… g bricks! They decided they had seen enough and left. We emerged sheepishly and ‘Taffy’ went to see if the street was clear. Just up the road was a straggler on his bike. The bike was belching and farting like a good un! ‘Taffy’ ran around the counter, grabbed a chair leg and went for the rocker. It was hilarious watching the unfortunate rocker on his bike which was going in fits and starts whilst ‘Taffy’ was beating him about the back with the chair leg! Major battles between Mods and Rockers were few and far between. There were odd confrontations such as the ‘Battle of Upper St’ – (clip attached) but these were blown out of all proportion by the press and were usually no more than minor skirmishes. We tended to keep to our own ‘patch’ as did the rockers but on occasions the two cultures would clash. One such altercation was at the Gatehouse pub in Highgate. The pub had a large back room and it was decided to put it to use by holding a dance. Of course, being on our manor we attended. So to, did a small group of Rockers. Needless to say a fight broke out and the Rockers were put to flight. The occasion only sticks in my mind because as the Rockers were being chased I picked up a lump of concrete from some roadworkings and aimed it at the head of one of the fleeing Rockers. It missed him completely (I was rubbish at cricket also!!) and promptly hit my best mate full in the face! What a mess – there was claret everywhere. Luckily no lasting damage was done but several years passed before I broke the news that it was I that had caused his ‘war trophies’!! Of course, the big Mod and Rocker confrontations were at Bank Holidays. The coastal towns were the favourite destinations and there was much posturing and ‘drive pasts’. There was relatively little confrontational violence however in spite of what the press would have us believe! Rockers very rarely left the comparative safety of their bikes which enabled them to pass along the front as leisure but with the advantage of being able to escape at speed if desired. They were more of a threat outside the towns where they could harass and confront smaller groups of Mods on scooters. The Bank Holiday fair at Hampstead Heath was another choice of destination for gangs of Mods and Rockers. Fairgrounds have traditionally attracted gangs of teenagers and still do for that matter but Rockers seemed especially keen. I am not sure if it is the adrenalin rushes of the rides or the music pumping out or a combination of both but fairgrounds and violence seem to go hand in hand. A few of us ‘worked the fair’ on Bank Holidays. I worked on the Pirate Ship. This was an early forerunner of todays rides. The ship held about twenty or so and there were no harnesses or safety belts. The rope mesh around the upper sides were all there was to hang on to! It was my job to collect the fares. This had to be done whilst the ride was in motion and involved leaning into the direction of the boat as it swung up and down! We had to learn how to jump from the boat onto the wooden platform as it swung past on its downward motion – no health and safety in those days! Of course there was an ulterior motive! When we returned change to screaming punters they would inevitable shout ‘put it in my bag’ or ‘put it in my pocket’ as they were hanging on for dear life. So we were able to pocket a little extra but then that is expected at fairgrounds? Gangs from all over North London would attend the fair over the holiday period and fights were common. Of course, the one gang nobody picked a fight with were the fairground workers! They were a tough bunch and if there was a confrontation with one then it was with them all. Rockers would make their presence felt at the Heath. They would arrive in sufficient numbers to be a major threat. Several times over the weekends there would be outbreaks of sporadic violence usually in the surrounding fields where police presence was limited. Although major clashes were avoided the local ambulance crews were kept busy! One occasion when we came face to face with our deadly enemies was on a trip to High Wycombe. A girl I was seeing at the time told us of a party in High Wycombe. Now High Wycombe was way out in the sticks as far as we were concerned (in fact most of us had no idea where it was!). In those days 40 miles was a looong way! Four of us decided to take a trip up there with a couple of the girls in tow. We had no invitation of course but … hey, who was going to stop us?!! We duly arrived at the house and barged in only to find the whole building was full of greasers! Talk about ‘doing a wrong ‘un!’ We thought we were in for a good kicking but to our surprise the guy running the party came over and made us welcome. We were absolutely gobsmacked to put it mildly. We had a great evening and even managed to shift a lot of gear (who said Rockers didn’t do drugs!). As a mark of respect we didn’t even steal anything! At one time I was seeing a girl that lived on a housing estate in Hornsey Rise. I would spend quite a bit of time on the estate where the two local ‘hard boys’ were a couple of die hard Rockers. Through the girl I got to meet the two guys in question and over a relatively short period we became good mates! They loved their music as we did albeit a different type. They were rebels and chose to show their rebelliousness in the way they dressed and behaved. The comparisons with our own Mod culture were there for all to see. The only difference was that they had chosen one path and we had chosen another. Athough the paths were different the goal was the same! But enough philosophy – they were Greasers and we were Mods and never the ‘twain shall meet! John is very kindly sharing this tale of his very eventfull Mod years . The first part of his story can be found here.